With CampaignDrive 4.15 new end users will have the ability to Self Register. The login page will now have a "Don't have an account?" 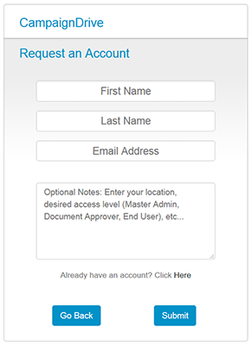 link, leading to a simple account request form. Prospective users will be able to submit their name and email address for account approval (an Optional Notes field allows for a detailed description of the role they need). User Self Registration can be set On or Off by administrators. Approvers will set up the new user's brand/location assignments.